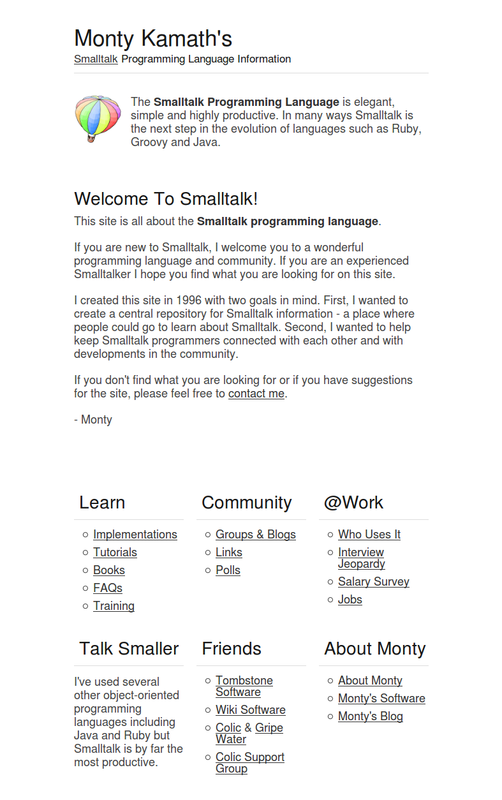 If you are new to Smalltalk, I welcome you to a wonderful programming language and community. If you are an experienced Smalltalker I hope you find what you are looking for on this site. I created this site with two goals in mind. First, I wanted to create a central repository for Smalltalk information – a place where people could go to learn about Smalltalk. Second, I wanted to help keep Smalltalk programmers connected with each other and with developments in the community. If you are interested in downloading any of my free Smalltalk IDE enhancements you can download them below. If you don’t find what you are looking for or if you have suggestions for the site, please feel free to contact me. I have written a lot of free software add-ons for Smalltalk development environments and frameworks for developing with various Smalltalks. Many of them are listed below. This is a free software framework for creating web applications in Pharo or Squeak. The framework is similar to ASP or JSP but for Smalltalk. The framework is simple, easy to use and very skinny. You can also download older versions of the framework here. Paul Berglund did a port of GsTools to VA 7.0. There is still some more work to do but this is a nice start. All sorts of IDE enhancements and shortcuts; A better Refactoring Browser code formatter; Some code to remove the StORE load notifier. Enhancements to nearly every browser as well as a framework for your own enhancements. Just a menu option to kill the VisualAge Organizer. Instance variable method generator, recursive partname finder & method generator, additions to rename classes, etc. Francisco Garau added these great Squeak like short cuts to do things like Alt+b and Alt+n and Alt+m for browse class, senders or implementors. The download works with GsTools for VA 5.0. I liked these tools so much I decided to post them here with Francisco’s permission. Lothar Mischke coded this up for eveyone to use with IBM’s EnvyQA free download. It works well.